Do you have Sydney ancestry? 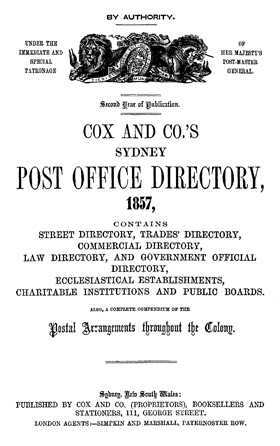 This was the second year of publication and appeared "under the special patronage of Her Majesty's Postmaster-General, who, fully recognising the necessity both of the existence and accuracy of such a work as the present, has allowed the various Letter-Carriers of the General Post Office to collect the information which now appears in our pages." It's an invaluable genealogy tool for anyone searching their family history or building a family tree.